This morning Josh was on the treadmill and tripped and scraped up his knee. Our treadmill has one of those keys to make it work that hooks one end onto the treadmill and the other end on the waistband of your pants, that way if you fall the key will come out and stop the treadmill. I've always been insistent that everyone who uses the treadmill needs to be properly hooked up to the key for safety reasons. In all the time we've used our treadmill, no one has ever fallen, but the key is a nice safety measure anyway. Well two days ago the key broke. The part that clips to your pants broke, so the part that goes into the treadmill to make it start still works but you can't hook it to yourself to stop the treadmill if you fall. I was planning to figure out where to buy a new key this weekend and told Josh to be extra careful in the meantime. And then, of course, today was the one day that he tripped. He dropped his iPod and tried to catch it and he fell and the treadmill didn't stop and scraped up his knee pretty bad. So he came upstairs to show me and it didn't look very pretty. But because he was on that awesome runners high you get when you finish running, he was mostly just excited to tell me that he finished week four of couch to 5k. This is the kid who originally gave up on the first day of week two. He was convinced that he was never going to be able to do it and he quit, and then eventually decided to unquit and try again. 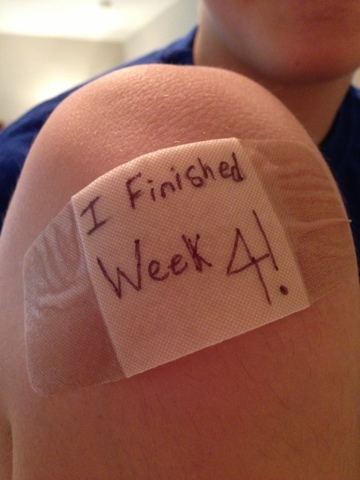 And not only did he make it through the first day of week two the second time, he now has just finished week four, which means he's halfway done with the program. He loves it. He almost never takes a day off from running, he's down there every morning. Before he started running I was starting to see some teenage attitude problems coming from my normally very sweet child. Running has totally changed his attitude. He's happy and motivated and energetic and not at all the mopey teenager I was afraid we were starting to see.